Welcome to the ticket information page for Destination Star Trek Birmingham. Below you will find all the different ticket types available and their prices. Destination Star Trek Birmingham uses an online ticket system called Eventbrite to sell all available tickets for this event, and tickets can only be purchased using this system. All tickets will be sent as a .pdf document to the email address given at time of booking. Please take care to ensure your email address is correct. You can bring a clear (not draft) print out of all your .pdf documents to be scanned at the event and or you can use your phone to display the ticket to be scanned. In some cases your .pdf ticket will be exchanged for a pass/tag if applicable to your ticket. Destination Star Trek Birmingham has a variety of different packages to suit different needs, from an all in to a bit of everything, these packages have been designed to enable everyone the chance to make the most out of their visit. N.B. Please note we have no single day tickets available for Friday. The only way to attend Friday is with a 3 day ticket or one of the special packages. For more information on standard tickets, including child tickets, click here. You can purchase additional individual photo shoot tickets for our announced guests - regardless of what your package includes. Unless clearly stated as included in your package, photo shoots on bridges and in costume are an additional item that needs to be purchased seperately - check the photo shoot page for full details. Autographs are only available to purchase at the event on the day. Visitors who require constant care may bring a carer along with them to the event. Carers can collect a 'carers pass' on arrival at the event from the box office if accompanying a fully paid ticket holder who requires assistance. This pass will allow you into the event and into areas where the person you are caring for has valid tickets for. The pass itself does not entitle you to photo shoots or autographs with the guests unless a valid photo shoot voucher or autograph token has been purchased. The carer or person who requires assistance must provide valid documentation in order to obtain the carers pass. Children who are 5 or under on 25th October 2019 do not require a ticket but must be accompanied at all times by a paying adult. 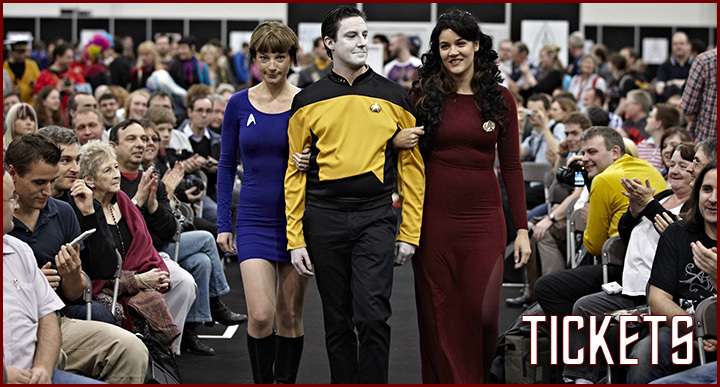 Destination Star Trek Birmingham will be taking place on Friday 25th, Saturday 26th & Sunday 27th October 2019 at the NEC, Birmingham. Once a ticket is processed and purchased it is non-refundable and non-transferable. On purchase of your ticket you will receive an email that will contain your ticket in PDF format. This will need to be printed or displayed on a mobile device at the event, you will then receive your event pass that will grant you access to the event for the days you have purchased for. Please ensure your email address is correct when purchasing your tickets; any errors could delay the instant delivery of your confirmation and ticket via email. In the event of the Destination Star Trek Birmingham being cancelled by the event organisers, tickets will be refunded at advertised sale price. It is the sole responsibility of each individual ticket holder to ensure they attend all the timed events they purchase tickets for or their ticket gives them access to. Refunds will not be issued for non-attendance if that event takes place at the published time and location. In the situation where a published event is allocated to a new time or location, all efforts will be made to communicate this prior to the event or on the day by the organisers. Ticket holders are advised to ensure they do not ignore any notices or updates communicated by the organisers as refunds will not be issued for a no-show. Only in the situation where a particular event can no longer take place, such as guest cancellation, will refunds be automatically generated on individual tickets purchased - this refund will not apply to packages that may include a cancelled item. An alternative will be provided automatically to the same value instead. It will be presumed by the organiser that visitors who purchase tickets are aware that included activities in their ticket type, or advertised as being at the event, can take place on any of the open days at any time determined by the organisers. It is the responsibility of the ticket holder to be at the event on the days they purchase for, during open hours. Any activities missed due to the purchasers not being at the venue at that time is not the responsibility of the organiser. Activities missed due to unforeseen circumstances on the day, event delays or organiser intervention must be made aware to the event team at the event ASAP. Every effort will be made to reschedule or sort the issue out there and then. No refunds can be issued for missed events once the event has closed. All Package holders will need to display their Event passes at all times whilst at the event. Lost or stolen passes on the day needs to be reported immediately to members of event staff.